Darren Lynn Brosman has been one of my favorite horror directors within the last ten years. With films like “Repo: The Genetic Opera”, “The Barrens” and most recently “Alleluia: The Devil’s Carnival 2”, there’s a reason why he has been great for the horror genre. When I heard about his latest “Abattoir”, I knew that I had to see this one way or another because his films have been so good. The film is about an investigator reporter who has to come to grips with a tragedy when her son in law mysterious kills her sister and niece. She is aided by a detective who’s trying to find out what happened and would make her son in law commit those murders. Their investigation takes them to a haunted house has been built out of various tragedies. Soon, they come across a mysterious man who has all the answers and how the house is linked to the murders. Can they find out what happened before the both of them become a part of the house’s tragic history? I’ve personally have seen just about everyone one of Bousman’s films since he burst on to the scene with “Saw 2”. It’s amazing how he grown as a filmmaker, as he is one of the best horror directors out there period. 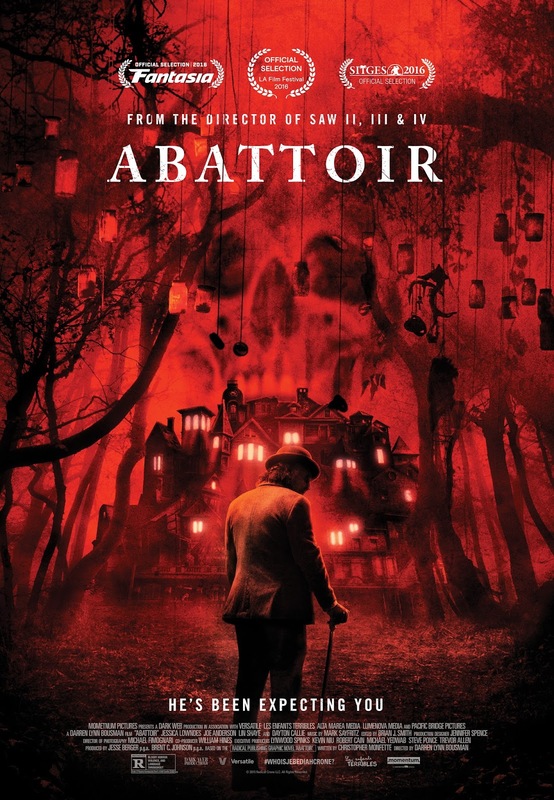 With that said, I thought his latest film “Abattoir” is his best directing that he has done to date. One of the things that makes Brousman’s direction great was that he’s able to make everything have this consistent dark look to all of his films. Whether its “Repo” to his lessen known films like this, he’s able to bring a level of dread and darkness that makes the images feel like you’re watching a gothic film noir. It’s what makes this film look very well from a visual standpoint and enhances the screenplay that you see it on screen. The other thing that Brousman does very well is the way that he directs his cast. He makes sure the performances are interesting enough that it gels very well with the gothic and dark tone that this film is going for. It’s always been one of the reason why his films have been entertaining. Speaking of the performances, I thought the star of the film was Dayton Callie. He does a very good job making sure that he gives the character a villainous Jim Jones type tone to it. It helped make his character frightening to watch every time he appears. The film also has a strong lead performance from Jessica Lowndes as the reporter trying to investigate her sister and nephew’s deaths. She really does a good job making her character very dark which makes her quest to find out the truth engaging. It kept me interested even though the end result felt predictable. The screenplay was good for the most part. What I liked about Christopher Monfette’s screenplay was it was able create a level of dread and had a gothic feel throughout the film. Whether it was the intense action to how some of these characters were created, everything added so well to the film’s tone. It made it very dark and gloomy. The other thing that his screenplay does very well is that he’s able to develop the story. Whether it’s the way that it goes into the film’s antagonist to the way it follows its main character, everything is done in a way that makes the story interesting to watch. If there was one that I didn’t like about the screenplay was the fact that it was predictable. I hate that when you get the feeling how a film is going to end before it goes into the third act. It takes the fun out of it. Still, I enjoyed this film, as that’s the only grip I have with it. With its very good directing and its excellent performances from Jessica Lowndes and Dayton Callie, this is worth your time. 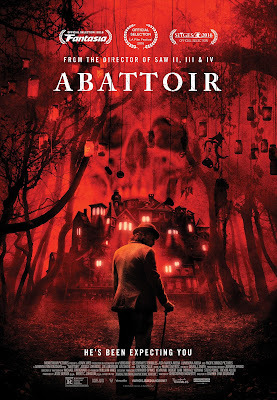 “Abattoir” is a very creepy and gothic film that will leave you with chills.